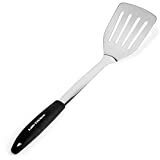 EASY TO USE: Easy lifting and flipping with our ergonomically designed spatula turner which allows you to handle your food conveniently and minimizes the risk of slipping thanks to the comfortable silicone handle. HIGH QUALITY MATERIALS: Made of very durable silicone and stainless steel metal that is BPA free and FDA approved. Our BBQ Turner is heat resistant up to 445° Fahrenheit / 230° Celsius and easy to use for all your cooking tasks without any problems. SAFETY FIRST: The premium quality silicone grip and finish ensures that you stay protected from the heat and the stainless steel handle is made long enough to keep your hands on a safe distance. DISHWASHER SAFE: Thanks to the high quality materials this silicone spatula is very easy to clean. You can either choose to clean by hand or you can use your dishwasher without any problems. MONEY BACK GUARANTEE: Our products come with a full, 100% money-back guarantee. If for any reason you are unsatisfied, just email us stating the reason you are unhappy and you will receive a courteous and prompt refund. It is that simple. Introducing the new Grill Spatula Turner by Daily Kitchen: A must have kitchen utensil designed for all cooking and BBQ enthusiasts! Finally, a spatula that makes your culinary life easier instead of tougher. hamburgers, fish or fried eggs without struggling! just email us stating the reason you are unhappy and you will receive a courteous and prompt refund. It is that simple! Don’t wait too long as the price will go up again very soon! What are you waiting for? Scroll up & click on the Add to Cart button now to experience this amazing Grill Spatula Turner yourself!